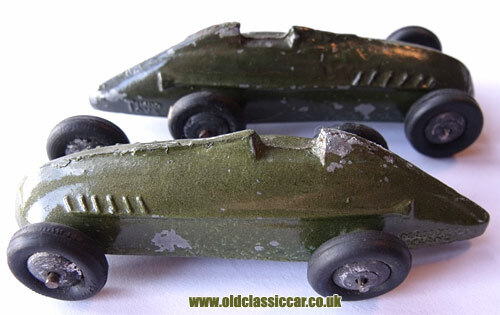 Timpo Toys racing cars of the 1950s. 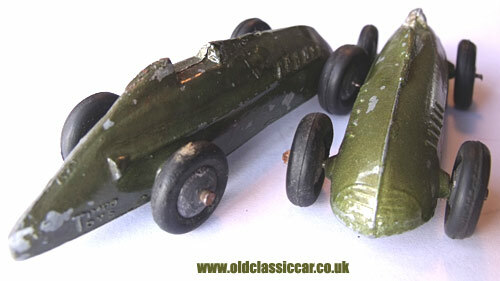 Vintage Timpo Toys racing cars. Collection of un-restored toy cars. All the cars shown here were purchased over a number of years at toy fairs. Although purchased individually, I've a recollection of seeing a set of similar toy cars in a toy museum some years ago. They were produced by Timpo Toys, and are marked as such on the offside rear corner of the tail. The other sides advertises that they were Made In England. Two are finished in slightly different shades of green, with another painted bronze, another in blue, with a final - well-worn - example that was originally painted gold. These Timpo Toys racing cars measure approximately 3.75 inches in length, and comprise a simple diecast metal body made from a cheap base metal, into which the two axles are inserted. They don't include bases. 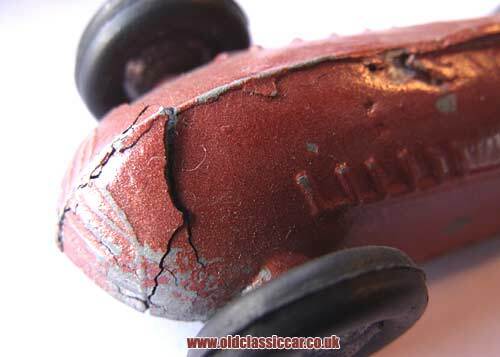 As the bronze example shows all too clearly, toys of this type can suffer with cracking to their bodies, a characteristic shared by other toys such as those produced by Crescent Toys. I would think that these cars were produced in the late 1940s or early 1950s, although in style they echo the thundering streamlined racing cars of the type seen at vintage Brooklands throughout the '20s and '30s. Timpo Toys ("Toy Importers Company") began toy production in the late 1930s, and continued following WW2 until 1978, by which time plastic toys had taken over from the type shown here. 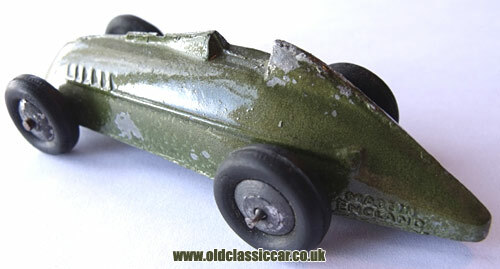 I've a few examples of another racing car toy produced by this firm, I'll be adding them in to this section of the website shortly.